Last week I had bank holidays on Friday and Monday so I took the opportunity to walk a few stages of the Camino de Santiago (Road to Santiago) with my Japanese friend Mitsue-san. 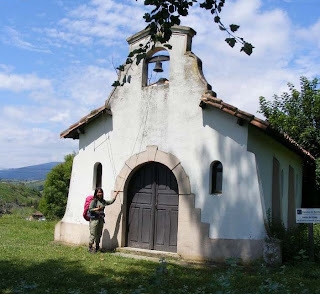 At the first post of this blog, I talked about my experience with the Camino. In that occasion, I walked part of the most typical version, called Camino Francés (French road). 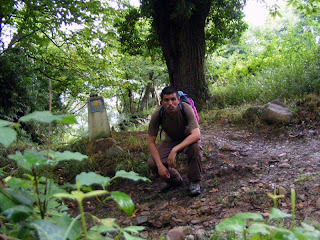 Last time I walked three stages of the Camino Primitivo (Primitive Road), starting at Oviedo and finishing at Tineo. I found this road much more beautiful because it goes through a lot of hills and nature. In the picture above you can see what a bit of the road looks like. It was full of green nature, humidity and rural villages. On the left of the image, in yellow and blue, you can see the sign that indicates the pilgrims the right path (the basement of the shell indicates the path to follow as if it was an arrow). This Japanese pilgrim above, is my friend Mitsue-san. She is a real expert on the road now because she has walked it a lot of times and she has been a hospitalera (volunteer in one of the numerous hostels where the pilgrims sleep over). I got to know her in the French road and since then I have met her several times and places including her town in Japan, Chigasaki. The path passed by a quarry full of interesting old construction machines. I stopped there to take some pictures. Actually, I think I took loads of pictures that day! The reason is that I would like to make a new comic and I want to put as many details as possible by using reference photographs. A big part of the road goes through the region of Asturias. 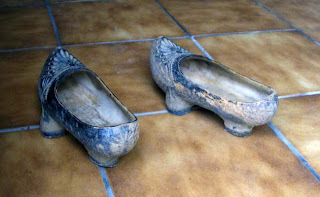 In Asturias, as well as in other regions in the north of Spain like Cantabria or Galicia, there is a especial type of shoes called albarcas that are mainly used in the rural areas to protect the normal shoes from the rain or the mood. The last day of the road I was walking with another Pilgrim (Esther) and unfortunately we took the wrong path and had to follow a car's road for some kilometers. On the way to Tineo, we passed by this funny clock at 11 am!! 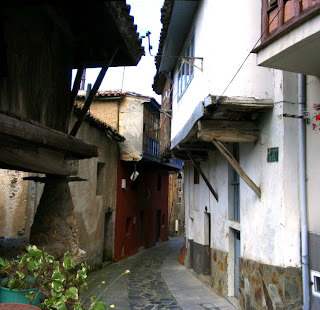 If you walk the road that goes through Asturias, you will see here and there these traditional buildings shown in the picture above. They are called hórreos and they are basically used as granaries and as a place to store objects (i.e. agriculture tools). 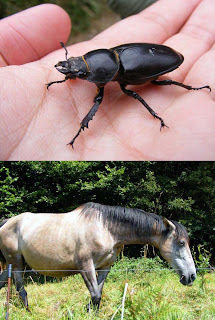 They can be easily unmounted and transported to another place. People doing the pilgrimage to Santiago normally sleep over in hostels that are typically run by volunteers. Most of them are based on donation or symbolic prices. 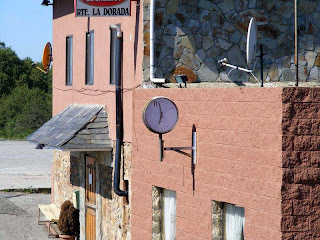 In the picture above you can see the hostel of Tineo which had impressive views of the Valley. There were also some books to entertain the pilgrims and a municipal swimming pool nearby where some of us (Esther, Unai, Emiliano and me) had a pleasant bath. 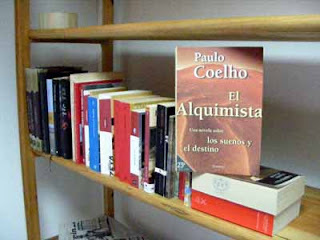 Among them I found the Alchemist, a very interesting book that I read some months ago after my friend Nusense recommended it to me. The first day of the trip, I spent the night in the hostel of Grado. The second day, we wanted to sleep over in Salas but when we arrived there we found out that the hostel only had 6 beds and 5 of them were already occupied. I told Mitsue-san to sleep in the bed left and I went on with two men, Salva and Joan, for 10 Km more where there was a cheap hotel. They worked for the football club Barcelona and they were really nice people. Anieke: a beautiful and super-nice girl from Holland that was doing the Camino alone. 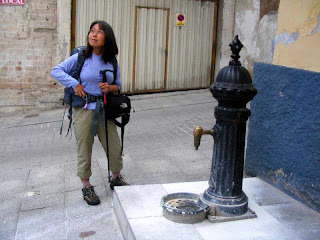 She had studied to work with children from 10 months to 4 years old and at the moment she was jobless so she had taken the chance to come and walk the Camino. I met her the first day and she had already walked something like 22 days. I think she started from St Jean Pied de Port, in the Camino Francés, and then decided to change to the Camino Primitivo because it was too crowded (good decision!). Asier and Unai: two nice and very friendly guys from Bilbao. We told lots of jokes during the dinner and it was an excellent company I think. Unai works as a physiotherapist in Barcelona and wanted to specialize in Neurology (i.e. Christopher Reeve). And Asier seemed to be very interested in an organization that I am enrolled to called AEGEE. Esther: a very nice and good woman from Burgos that had started the road in Santander. We shared part of the road the last day, when we went through the wrong path :). She was very interested in studying English and I told her to write me an e-mail so I can recommend her some good websites. Emiliano: this guy was really interesting and also a bit mysterious. He looked quite like John Locke, one of the characters of the TV serie LOST. He spoke a very good English which is not very usual for a man of his age and I have the feeling that he has travelled a lot in his life. He used to practice Yoga and Meditation and told us that he had gone to India to learn from the masters. 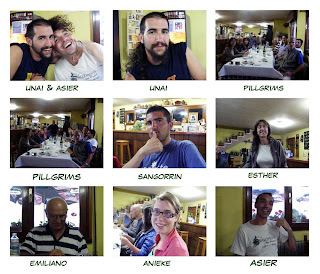 There were also other pilgrims in the dinner like Mitsue-san, Clodo (a guy from Argentina that had a very nice hat and loved to fish), some guys from Jaén, and other pilgrim that seemed to walk very hard. Apart from the people in the dinner and the guys from F.C. Barcelona (Salva and Joan) I met and talked a lot with a very nice couple that was coming from Warsaw, Poland. Shame I don't have any picture of them.